Last week INTERNeX New Zealand was invited to a networking event by our business partner Stray travel. As one of approximately 15 other companies we went to the Stray office, but there was one issue we had to deal with before starting the evening. We needed to be dressed as one of the bus stops of Stray in New Zealand (www.straytravel.com). 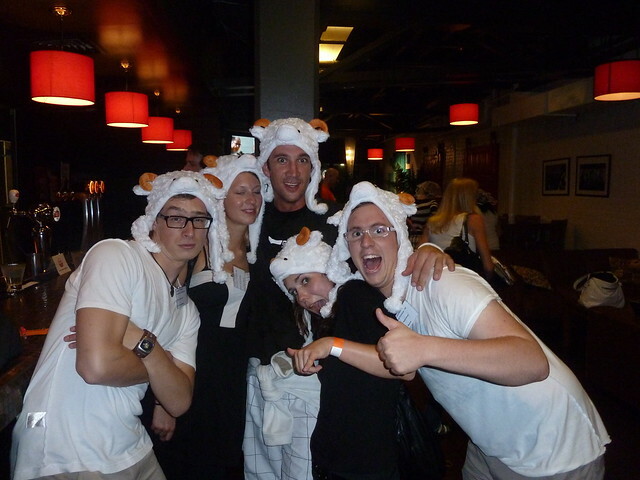 Therefore we decided to dress up as sheep from Rotorua. Well actually it was not really necessary for us to name a city because you have sheep all over the country, but finally we were three male white sheep and two female black sheep. We started the evening with some welcome snacks and drinks in the Stray office and some interesting chats with other companies from the Auckland Tourism Industry. The main event of the evening was the Sray-mazing Race through Auckland. The goal of the Race was to be the quickest team in solving funny riddle hints and succeeding in four different bar games. The race took place around the central queens street down and ended in the cool bar 1885. Absolutely exhausted and sweating like pigs – we arrived at the final destination and from now on it was time for waiting until all teams arrive and the organisers of the race would announce the fastest two teams. In the meantime we enjoyed the big gesture of the Stray team to provide us with delicious food and an open bar. Finally the two winning teams were announced and surprisingly our team was one of them. The prize was a all-inclusive weekend stay in the awesome Blue Duck Station down in Whakahoro for the whole team. We will tell you about this experience after the next weekend when we will be back in Auckland. Hereby we would like to say Thank You to the whole Stray Team for an absolutely amazing evening with a lot of fun. We hope that you all have a good week. This entry was posted in INTERNeX, new zealand and tagged amazing, auckland, business partner, fun, networking, race, rotorua, stray, tourism industry on May 11, 2011 by ixpaul.